Check out this post on the new version of Rink Stats. Hockey announcers and fans seem to have a lot of adages about when goals are scored during games. I just finished collecting and cleaning play-by-play data from every NHL game from the 2007-2008 season through the lockout-shortened 2013 season. In this post I'm going to look at some very basic attributes of the data. I also hope to convince you of the truth behind two common adages. 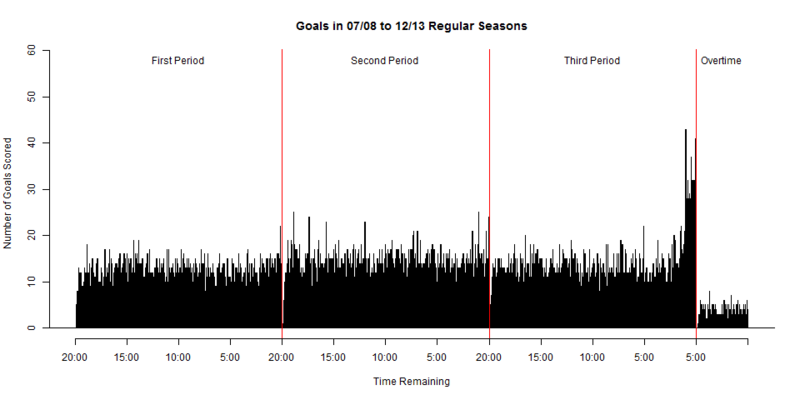 In the six seasons for which I have data, there were 37,523 goals scored. That averages out to be 5.47 goals per game. In terms of time-on-the-clock, goals come at the highest frequency with 1 second left in the 3rd period. In six seasons there were 58 goals at 19:59 of the 3rd. That works out to be about 10 last-second goals in an NHL regular season. Makes sense, since that's that's the time when it's most likely that one of the goalies is pulled. If we ignore the last 90 seconds of the 3rd period, when the number of goals per second spikes dramatically, the most common time for a goal to be scored is in the last second of the 1st period. There were 26 of those in 6 seasons. I don't have a great explanation for why this is, except that teams are probably most likely to be throwing pucks at the net as time expires. The graph below shows the total number of goals scored at in each second of all the games since 2007-2008. Each bar in this graph (as well as those throughout this post) signifies the total number of goals scored in those seasons for each of the 3900 possible times showing on the clock (3 periods x 20 minutes x 60 seconds + 5 minutes x 60 seconds). For example, the bar at 10:00 of the 1st period is 8 units high because there were 8 goals scored with exactly 10 minutes left on the clock in the 1st period. Because teams switch which goal they're shooting at between periods, each team plays the 2nd period defending the goal that is further from their bench. This is supposedly a disadvantage to defenses because it is more difficult for exhausted players stuck in their defensive zone to get off the ice (particularly on penalty kills). The adage suggests that this should result in more 2nd period goals. Let's look at whether it holds up to empirical scrutiny. The graph below is similar to the previous one, except that below I've left off OT as well as goals in the last 90 seconds of the game, when one goalie is most likely to be pulled. The red lines on these three graphs show the average number of goals scored per second in each period. They appear a little bit low because there's basically zero goals scored in the first 5 to 10 seconds of each period, so that pulls the average goals per second toward zero. What's immediately noticeable is that the line for the 2nd period is much higher than those for the 1st and 3rd. It seems as if this adage might have some validity. There were 13006 goals scored in 2nd periods in the six seasons' of regular season games. In the first period there were just 11080. And in the 3rd (before the final 90 second of the game) there were 10735. These average out to be 10.838 goals per second in the 2nd, 9.233 in the 1st, and 9.671 in the 3rd. If we ignore the 3rd period, where we have to deal with weirdness related to empty net goals, we can compare each clock-position in the 1st period to the corresponding clock-position in the 2nd. I've subtracted the number of 1st period goals at each clock time from the number of 2nd period goals at the identical clock time. Those results are in the graph below. 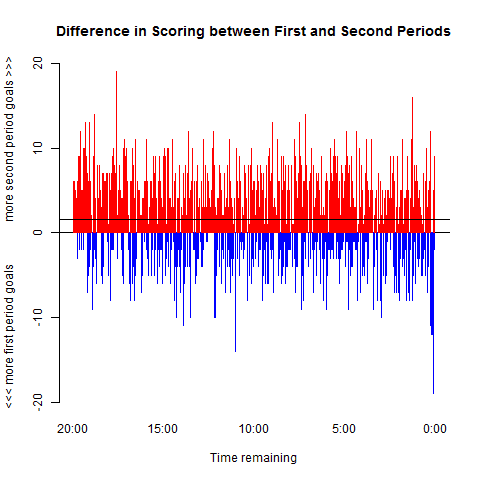 Blue lines on the graph indicate that, for those clock-times, there were more goals scored in the 1st period than 2nd. And red lines indicate times for which there were more 2nd period goals. There certainly more times for which 2nd period goals are more common than 1st period ones. The average difference between 1st and 2nd period goals was 1.626 more 2nd period ones. If I take into account the number of games in my dataset, this value of 1.626 is equivalent to saying that, in a single game, there are an average of 0.000237 more goals in each second of the 2nd period compared to the first. Doesn't sound like a lot, but there's 1200 seconds in a period so that means there's roughly 0.28 more 2nd period goals per game than 1st period ones. Clearly there's something going on here. I can't say with certainty whether the spike in 2nd period goals is directly attributable to the long line change, but it seems possible. Just for fun, I'm going to assume that this is the case and explore some hypotheticals. Hypothetical #1: What if the 1st and 3rd periods had the long line change and the 2nd had the short? If I assume that the number of goals in the last 90 seconds of the 3rd period won't dramatically change, I' estimate that the number of goals per game under this setup would jump from 5.27 (as it was in the last 6 seasons) to 6.03. Hypothetical #2: What if the teams never switched sides and the whole game was played with the long line change? Making the same assumption about the end of the third period, I estimate that the number of goals per game would increase even more to 6.31. Hypothetical #3: What if the teams never switched sides, but there was never a long line change? In this setup, the number of goals per game would drop slightly, to 5.19. I don't this will ever happen but it seems possible that if the NHL really wanted to increase scoring, they might consider making teams play the 1st and 3rd periods with the long defensive line change, instead of the 2nd. Defensemen and defensive-minded coaches would not be happy. Adage #2: Overtime game-winners either come very early or very late. A second adage, you often hear when watching an overtime regular season game, is that game winning overtime goals usually come either very early or very late in the period. What constitutes "very early" or "very late" is unclear, but for the sake of pinning it down, let's say it's the first and last 60 or 90 seconds of OT. 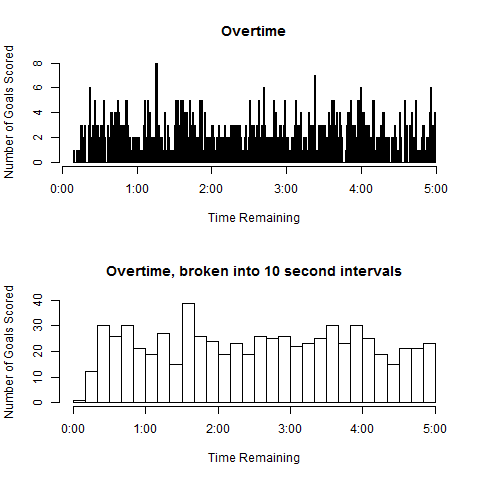 The top graph below shows the distribution of overtime goals, by time on the clock. 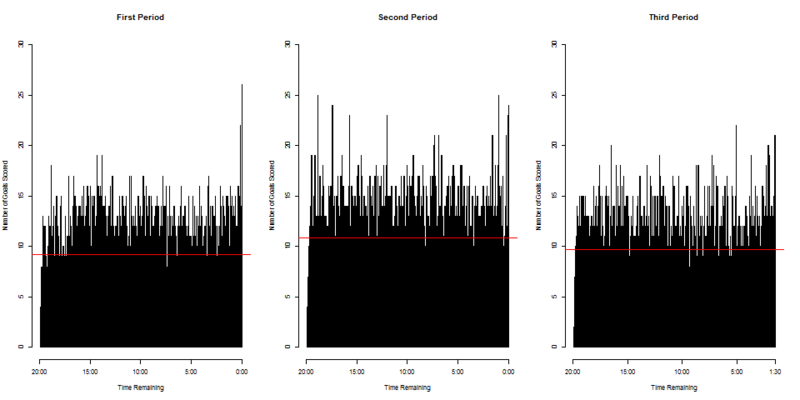 The bottom graph smooths out the trends somewhat by grouping together goals based on 10 second intervals. These graphs don't seem to support the adage. If anything, there appear to be fewer goals scored in the first 60 to 90 seconds of OT. And if you look at the last 40 seconds of the OT, it seems as it's actually less common to get a goal then, compared to the middle of the period. At best, I'd call this adage false. At worst, I'd say adage is the reverse of reality. I think the reason people tend to believe this adage, despite the evidence, is that when you're only playing 5 minutes of overtime, any goal can be called "late." Think about it. If somebody scores a third period game winner with only 3 minutes left on the clock, you remember the game as being won very late. If the game ends on an OT winner with 3 minutes on the clock, you'll probably also remember it as being a very late goal, even though it wasn't even halfway through overtime. The point is, overtime is so short that there isn't really a time on the clock when somebody would say, "yeah that wasn't an early goal or a late one." Long story short... More goals in the second period, perhaps because of the long line change? Fact. Overtime goals coming very early or very late? Fiction. I'm a doctoral student studying political science with a passion for statistics and hockey. How unusual was the ending of Monday's Game 6?